"My husband loves to bake these every year. 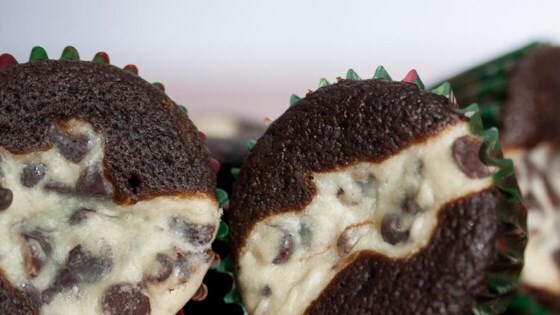 He often adds mint chocolate chips for the holidays." Preheat oven to 350 degrees F (175 degrees C). Grease or line 44 miniature muffin cups with paper liners. Beat cream cheese, 1/2 cup sugar, egg, and 1/8 teaspoon salt together in a bowl until filling is smooth; fold in chocolate chips. Sift flour, 1 cup sugar, cocoa powder, baking soda, and 1/2 teaspoon salt together in a bowl. Beat water, vegetable oil, vinegar, and vanilla extract into flour mixture until batter is evenly mixed. Fill muffin cups 1/3-full with batter; top each with about 1 teaspoon cream cheese filling. Sprinkle cupcakes with remaining 2 tablespoons sugar. Bake in the preheated oven until a toothpick inserted in the sides of a cupcake come out clean, 30 to 35 minutes.